One of the best ways to experience local culture and immerse yourself is by sharing time with the people and communities who live there. I try meeting new people, sometimes even sharing a meal with a local, when I travel. 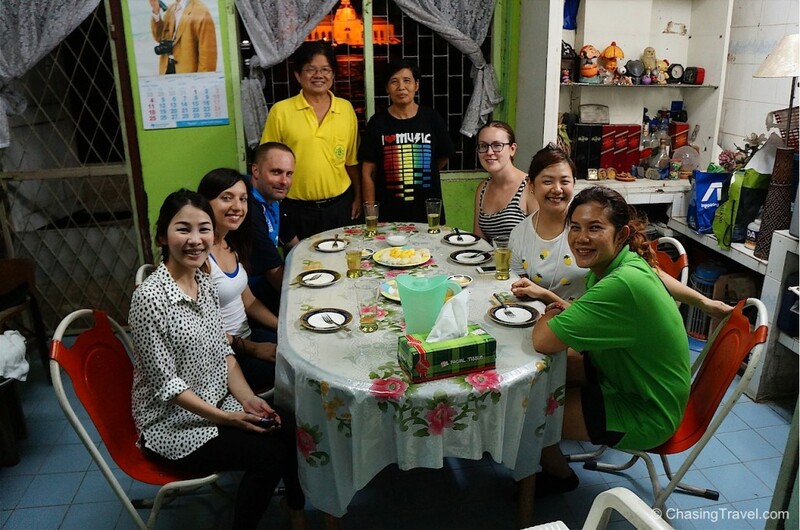 In Bangkok, Dan and I had dinner with a Thai family from the Kudijin community. We met them on our bike tour with Grasshopper Adventures cycling Bangkok’s hidden streets. I was intrigued to learn we were about to dine with some of the first descendants of early Chinese settlers to Thailand. Mr. Sek was so kind to invite us into his home and share his home cooked meal with us. He’s the head of the Kudijin community who often wears yellow. Yellow is the symbol of someone’s role as leader of their community or representative of the king so I felt my stay with the family was really important. He also wants me to tell you his name is pronounced Khun (which means Mr. or Mrs.) Sek. His wife who is now 60 years old tells us she was born in this very house and lived here her entire life. He joked her name is Khun Toy. Clearly, dinner was off to a fun start. 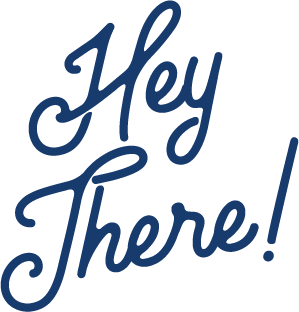 Long conversation, laughter, and retelling stories is a staple around the Thai dinner table. Eating together is also an important part of their culture. In North America fewer and fewer families actually sit and eat together these days. Consumed by work, errands, and jam-packed schedules most people just grab a bite as they’re heading out the door or eat TV dinners by the TV. By contrast, Thai families believe in home style meals, sitting around the table together, and sharing dinner in the same room. I was intrigued to learn sharing is a big part of who they are. A typical Thai dinner is made up of lots of different dishes and everything is shared. All the dishes are served at the same time in the centre of the table for everyone to dig in. One of the preconceived notions of Thailand I had was that a Thais custom was to eat on the floor or mat, and use chop sticks for every dish. 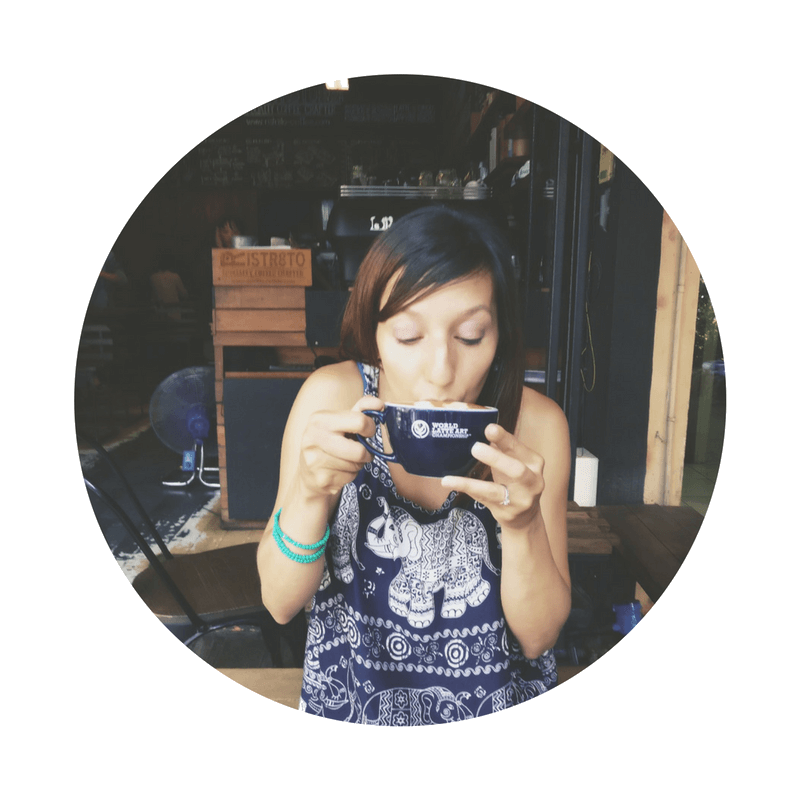 I know – my views were very simplistic having never been to Thailand before. Instead, Thais eat with a fork and use their spoon to gather noodles, eat soup, or cut things like a knife. I rarely saw a knife offered at Thai restaurants. It’s an interesting quirk about the culture I think is kinda neat. 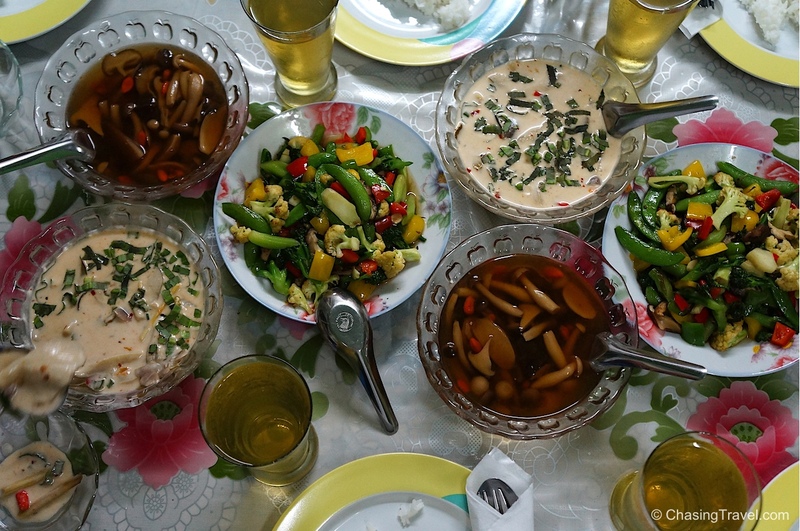 We got to try homemade Chinese-style mushrooms and Tom kha kai which is a spicy creamy mushroom soup made of coconut milk, lemongrass, and kaffir lime leaves. Of course no Thai dinner table could be complete without vegetable stir fry (or any stir fry actually, they are all so good). 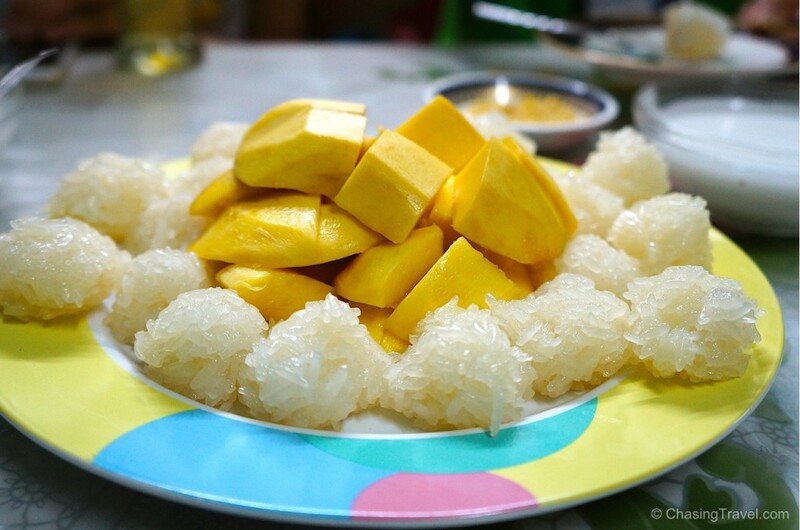 Khao Neeo Mamuang (mango sticky rice) topped with coconut milk was definitely a highlight for dessert. I tried it in other places around Bangkok but this one from their home was probably the best. 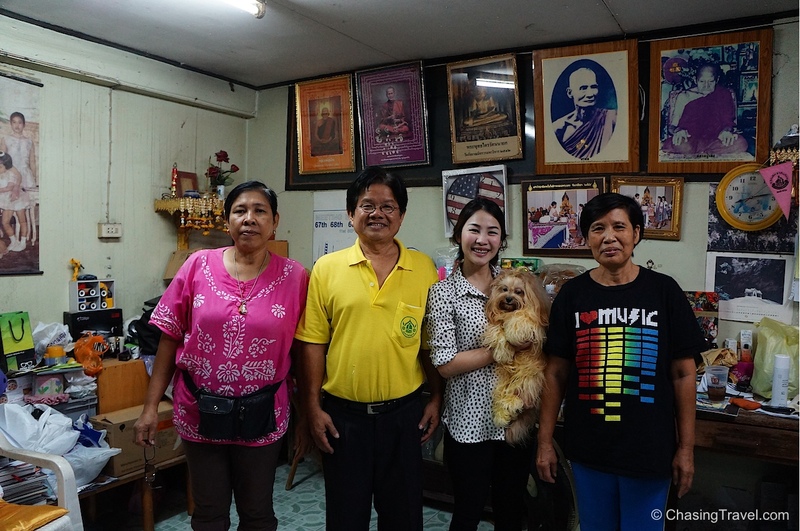 Thank you to Khun Sek and his wonderful family for inviting me into their home on the Bangkok Bike & Dine Tour with Grasshopper Adventures. As always, all opinions are my own.